Evans was the star of the game. Sussex is the second team to qualify for the finals day in the Vitality T20 Blast. They did so by defeating Durham at the Riverside Ground in Chester-le-Street in the second quarterfinal. This match, just like the Quarterfinal-1 was a low-scoring game courtesy some disciplined bowling from the Sussex bowlers. It didn’t seem as if Sussex missed Rashid Khan in this crucial encounter which should give them a lot of confidence going ahead. Laurie Evans was their best performer with 63 off 47 runs. He ensured that he remained in the middle till the end and got his team over the line. Hence, he was adjudged the ‘Man of the Match’. After winning the toss, the hosts Durham opted to bat first. It was a new opening combination for the team which walked out into the middle. Skipper Tom Latham had to sacrifice his opening slot for Ben Stokes, who joined the team just before this game. The openers got the team off to a flyer with 47 off just 3.3 overs before Graham Clark was dismissed for 16 runs. There weren’t any notable partnerships after this wicket fell. 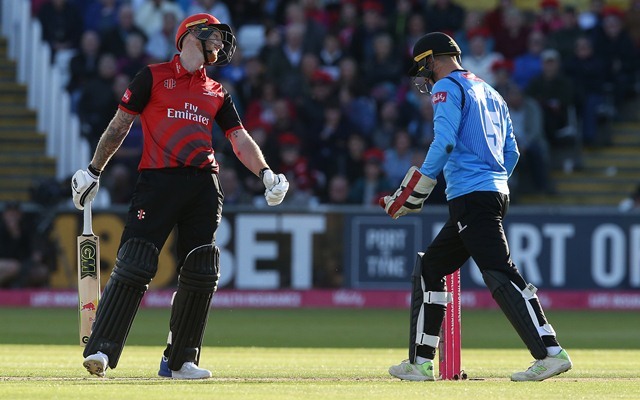 While Ben Stokes got out after scoring 34, Latham was dismissed for 16 runs. However, no one else except for Stuart Poynter reached the double-figure mark after this wicket. Poynter was unbeaten on 28 off 24 balls as his team posted 140 runs on the board for the loss of 7 wickets. Danny Briggs and Will Beer picked two wickets each. In the chase, Sussex lost both its openers for low scores. While Philip Salt got out for 4 runs, the other opener Luke Wright was dismissed after mustering 12 runs. Post these two wickets, Laurie Evans and Delray Rawlins stitched together a good partnership. The duo added 70 runs before the latter got out for 42. Evans is in magnificent touch in this tournament and he made the most of it yet again. He played some glorious drives and didn’t take too many risks. David Wiese supported a bit with 16 off 13 balls as Sussex finished the chase off in the 19th over with 5 wickets remaining. Evans hit two consecutive boundaries at the end to finish things off for his team. Mark Wood looked impressive with the ball and picked two wickets for Durham. Result: Sussex won by 5 wickets.